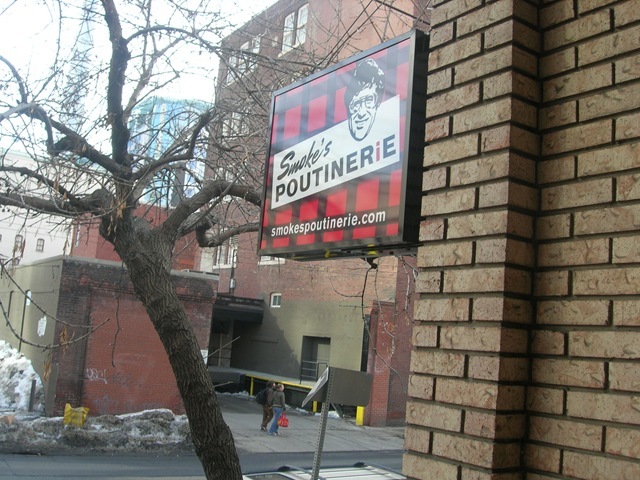 I was intrigued a few weeks ago when I found out that a restaurant dedicated to serving poutine and poutine only had opened up on Adelaide. 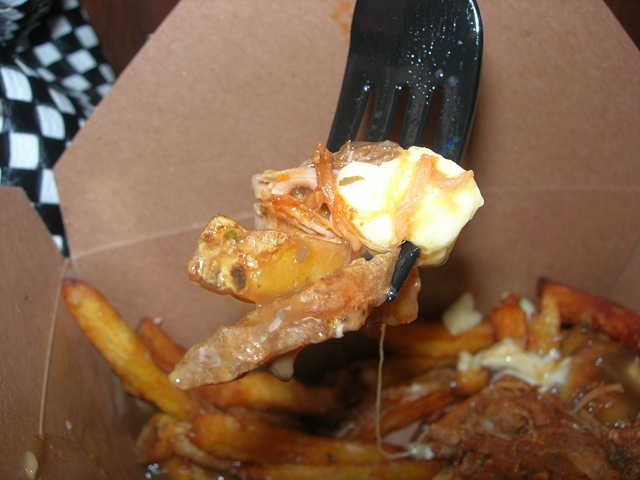 I am not embarrassed to admit that my first exposure to poutine was at KFC several years ago. Don’t even think of giving me the eyebrow, because I know that you know how amazingly heavenly that thick, greasy gravy is. Of course I was intrigued by the idea, and after watching a spot they did on one of those daytime shows on CBC, I thought I’d head down. 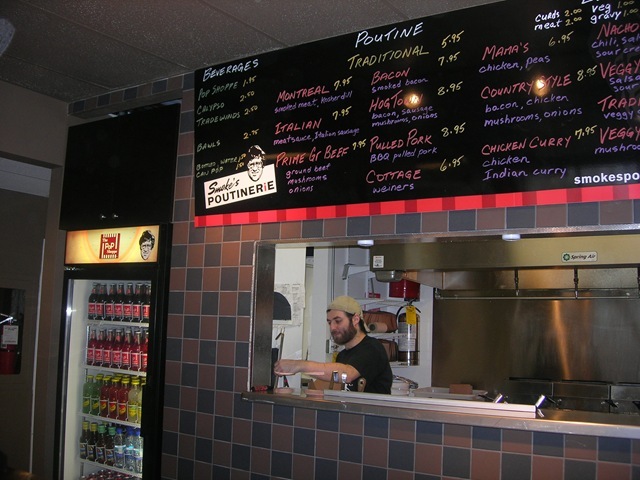 The location is in the entertainment district at University and Adelaide, and literally hovers over the after-club munchies capital of the world, Burrito Boys. The space is decorated in a retro-modern diner theme, hosting only a handful of tables and some bar like sitting areas. Smoke’s boasts 4 types of gravy, and topping combinations that remind me of my experience at Pink’s Hot Dog Stand in Los Angeles. 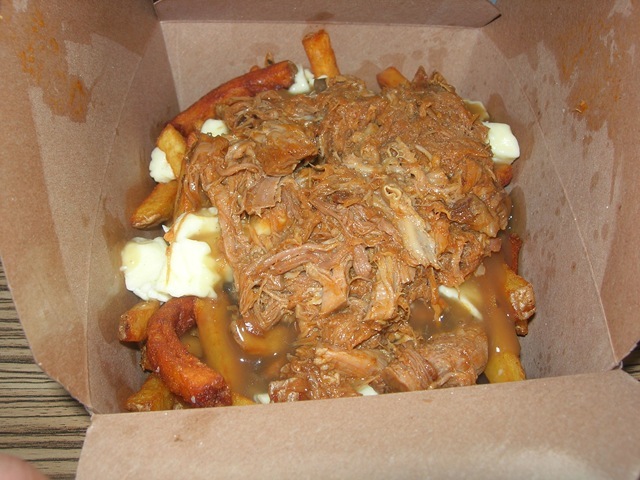 I ordered the pulled pork poutine and was overwhelmed by the quantity of spuds that was placed before me. Kudos to Smoke’s for successfully preparing pulled pork that was succulent and tender. I found the fries to be slightly too greasy, and their vegetarian gravy to be to sweet. The cheese curds that they use took quite some time to melt. However take-out customers will be able to experience cheesy strands of melted goodness before they reach their office desks, as the cheese has time to heat through. Would I go back? At this point no. Smoke’s has only been around for 3 months, they still have some kinks that they need to work out in their recipe. Top my KFC poutine with their pulled pork, and we’re in business! the cheese isn’t supposed to melt!!! No one likes cold cheese curds.